The Sukup Safe T Home® is extremely efficient and exceptionally safe. With a construction time of one day and a useful life of 75 years, the homes ship 10 per container. They have lockable windows and doors, have withstood a Category 4 Hurricane, and are fire-proof, termite-proof, and machete-proof. and the culture from the beginning has been to treat employees well and give back to the community. The Safe T Home® is just one example of how Sukup gives back, but takes it to a global scale. In October 2016, Category 4 Hurricane Matthew battered Les Cayas, Haiti. At the time, 200 Sukup Safe T Homes were already constructed in the area. Sukup Safe T Homes are patented engineered structures that are suitable for all phases of recovery effort. They are quick and easy to construct, making them ideal for emergency situations. The all-steel construction makes the Sukup Safe T Home® perfect for longer-term use, since they are weather-proof, fire-proof, and termite-proof. They are also movable, making them well-suited to transitional shelter needs. 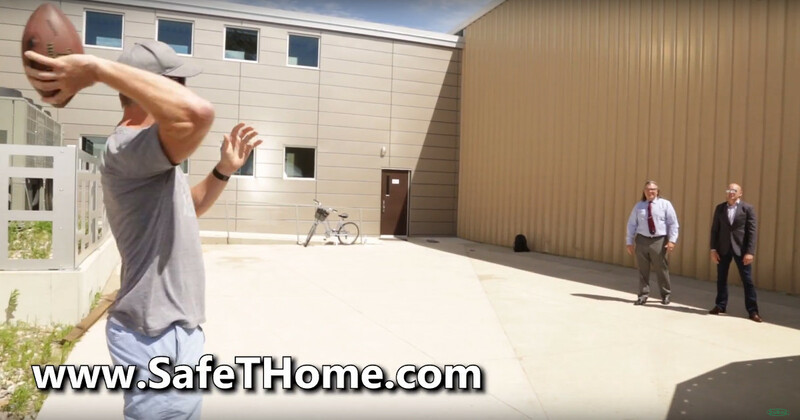 The round shape of the Safe T Home® allows the unit to withstand high winds. They are also virtually earthquake-proof. The Safe T Home® kit includes basic hand tools, which a crew can use to build one home in one day. An added feature of the Safe T Home® is a rain water collection system for clean drinking water. A solar panel bracket can easily be affixed to the roof of the Safe T Home® to provide a source of energy. The Safe T Home® is used primarily for shelter, but also for dental clinics and birthing centers. • Sharing the Safe T Home® story with more than 150,000 attendees! GoServ Global has teamed up with Sukup Manufacturing Co. to bring relief to the families without homes. Using highly-modified grain bins, what we call a Safe T Home®, we have been able to provide nearly 200 homes in Haiti alone. This has allowed people without homes since the massive and devastating earthquake in 2010 almost to finally have a place of their own. In addition, GoServ Global’s latest Safe T Home® project in Peru is the Hidden Creeks Bible Camp. HurricaneMatthew Matthew, hitting Haiti in October 2016 with winds of up to 145 mph, put the nearly 200 Safe T Homes® in Haiti to the test. ALL of the Safe T Homes® withstood the hurricane with minimal damage!